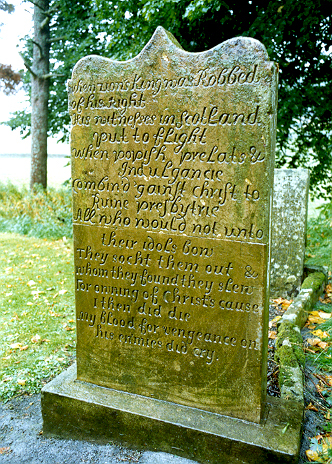 The gravestone was erected in1726. The obelisk at the church door was erected in 1837. A new memorial next to the headstone was added in 1910. Erected in the year 1726.
and casted headlong over a high steep craig. John Hunter was shot at the Devil's Beef Tub, where a second memorial commemorates him. An obelisk near to the church door commemorates Hunter, and in the lower part of the churchyard, to the north of the church building, are two headstones to Hunter at his grave.